The main fence types and installation services we provide at Twin Cities Fence deal with fencing installation. We specialize in installing a variety of fences of differing materials, sizes, shapes, and designs, ensuring that we can meet every residential and commercial fencing installation need. 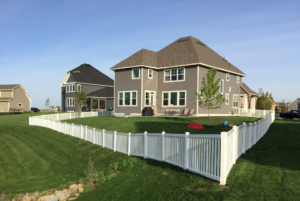 Vinyl Fencing – Privacy fences, picket fences, or ornamental vinyl fencing for a contemporary and durable fencing system that requires very little maintenance. Cedar Wood Fencing – Wooden picket, privacy, and post and rail style fences, perfect for a more custom fence design. Galvanized Steel Chain Link Fencing – Affordable zinc-coated galvanized steel chain link fencing for creating boundaries on commercial and residential properties with added strength and durability. Color-Coated Chain Link Fencing – With color-coated chain link fencing, you’ll have the advantage of a custom-colored dual layer of protection with a PVC coating overlaying zinc-coated galvanized steel. Steel Ornamental Fencing – A traditional decorative and durable fencing system that’s weather-resistant and adds aesthetic curb appeal and secure fencing for commercial and residential properties. Aluminum Ornamental Fencing – A more affordable option than steel, aluminum is another weather-resistant ornamental fencing material used to imitate traditional wrought iron fencing.